Not that long ago there were five homeopathic hospitals in the UK: London, Tunbridge Wells, Bristol, Liverpool and Glasgow. The Tunbridge Wells and Liverpool hospitals have since closed and the pharmacy at the Glasgow one is no more. As for the Bristol hospital, it started out in its own building near the centre of Bristol (Cotham Hill), then it became a small clinic in the new South Bristol Community Hospital. Earlier this month, just three years later, this too closed to be replaced by a private clinic, the Portland Centre for Integrative Medicine, that is no longer part of the NHS but that is now just contracted to provide homeopathy services to University Hospitals Bristol. It's situated in Litfield House Medical Centre, which offers private consulting rooms, some six miles from the hospital. Today, there remains only the Royal London Hospital for Integrated Medicine (the re-named Royal London Homeopathic Hospital) and the Glasgow Homeopathic Hospital (aka the Centre for Integrated Care, as they like to call it). 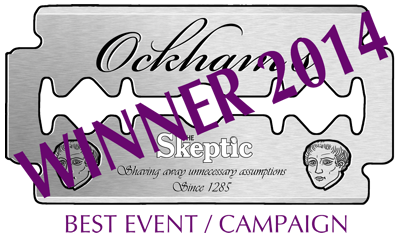 NHS Lanarkshire was the latest of the Scottish health boards to end funding of all treatments at the Glasgow Homeopathic Hospital, and, in August, one of it's previous patients from Lothian lost her judicial review at the Court of Session of the earlier decision by NHS Lothian, finally putting an end to the homeopathy supporters' protracted battle. But now we know that even the jewel in the homeopaths' crown, the RLHIM, no longer has a homeopathy service. But no homeopathy service. For their flagship hospital, closing that down must have been a bitter sugar pill to swallow. And in overall terms, we also already know that the number of prescriptions for homeopathy products supplied by community pharmacies in England has fallen by 94% in the past 17 years. We also know that very few Clinical Commissioning Groups fund homeopathy. 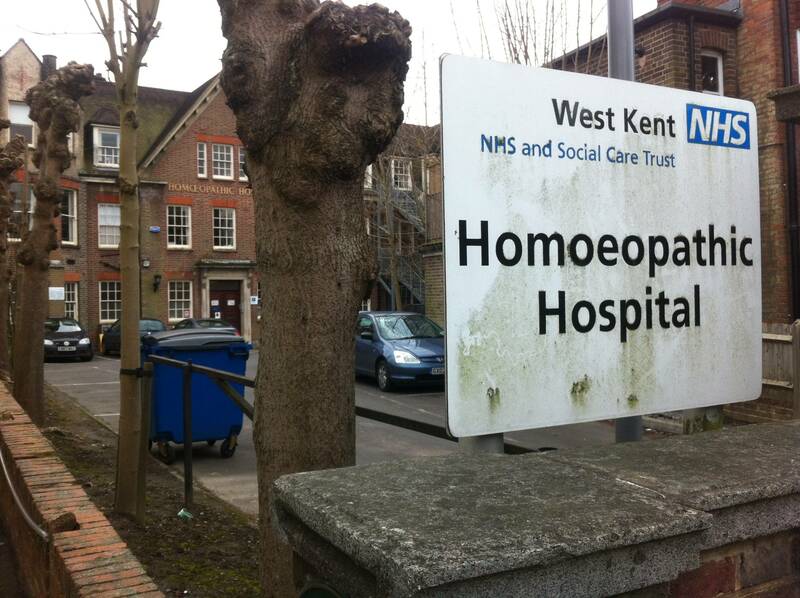 How much longer will NHS homeopathy survive this downward spiral? 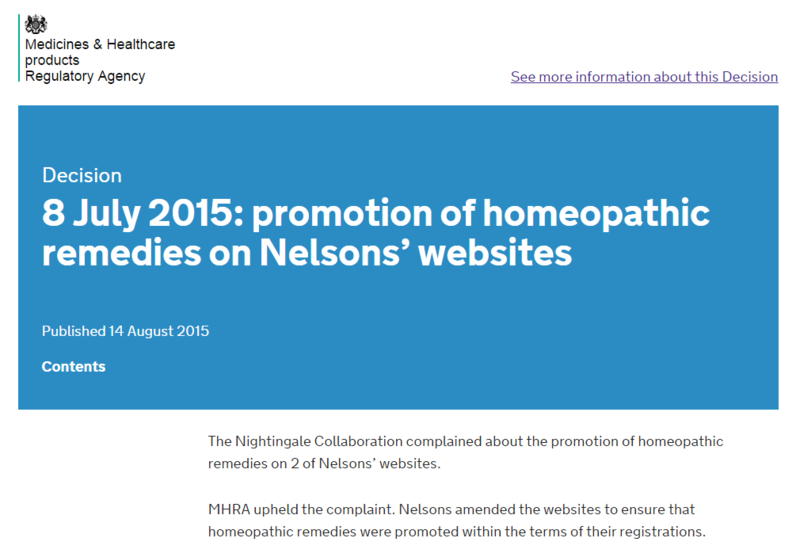 After Nelsons were reprimanded in August (as a result of our complaint), another homeopathy manufacturer was today admonished by the medicines regulator, the MHRA. 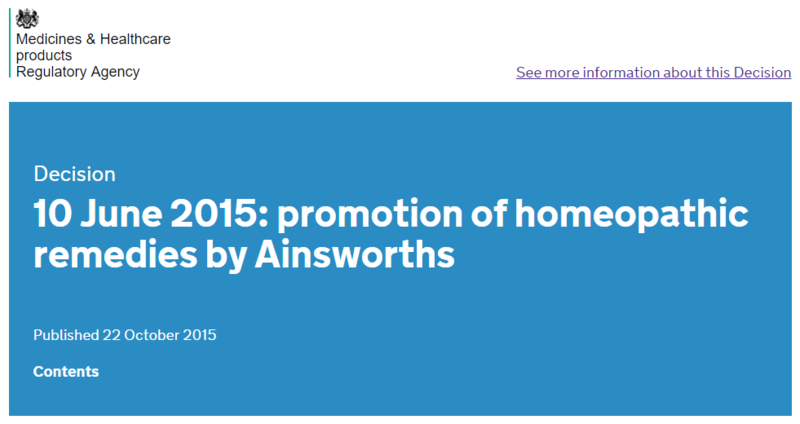 As part of MHRA’s regular review of advertising, we reviewed the Ainsworths website. Some unlicensed homeopathic remedies had the name of a commonly recognised disease or medicine. We were concerned that this could be seen as a claim to treat or prevent that disease. We were also concerned that remedy kits containing unlicensed remedies were being promoted for sale in the UK. Ainsworths agreed to remove the name of the disease and the medicine names from unlicensed remedies on their price list and amend the web pages with remedy kits. It's encouraging to see that the MHRA instigated this themselves rather then waiting for a complaint from a member of the public or a pharmacist, but it's disappointing that they have not given details of what products they were concerned about. In terms of the kits, they have been in trouble before, so it's disappointing to see them being pulled up again, apparently for exactly the same breach of the medicines regulations. 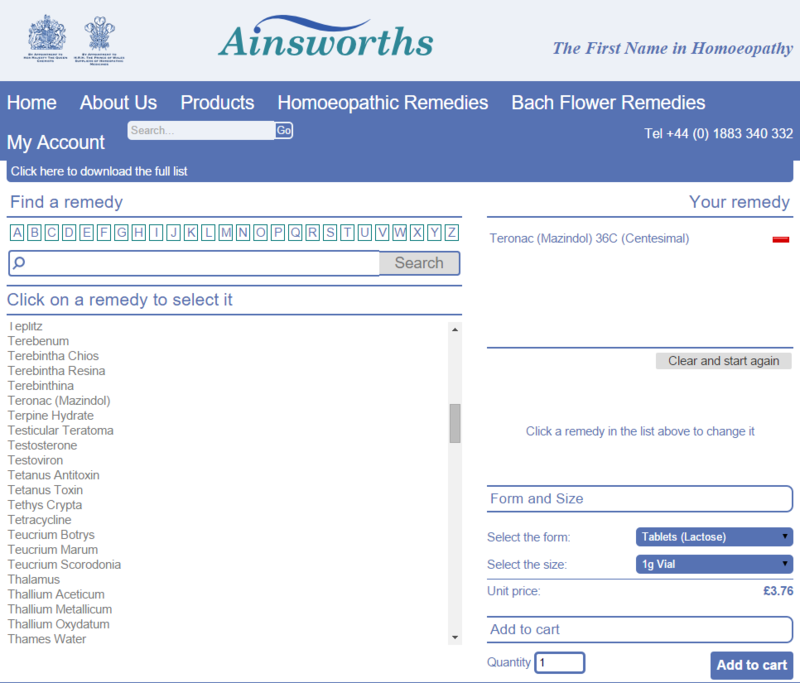 We sincerely hope that Ainsworths will comply with the MHRA's instructions to remove all products with the name of a commonly recognised disease or medicine, and — in the interests of not misleading the public — products that have names very similar to commonly recognised diseases or medicines. We're sure Ainsworths would not want to mislead consumers but we hope the MHRA will continue to monitor their website and take further action as necessary to protect consumers. The defunct Tunbridge Wells Homeopathic Hospital by Tannice Hemming. We know that boosting the immune system is a common claim made by advertisers of alternative therapies and supplements and something they might like us all to think is good for us. In fact, it turns out that boosting the immune system is not such a good idea at all. The testimonial in the advert could also give the impression that arthritis sufferers using this product can stop using painkillers. 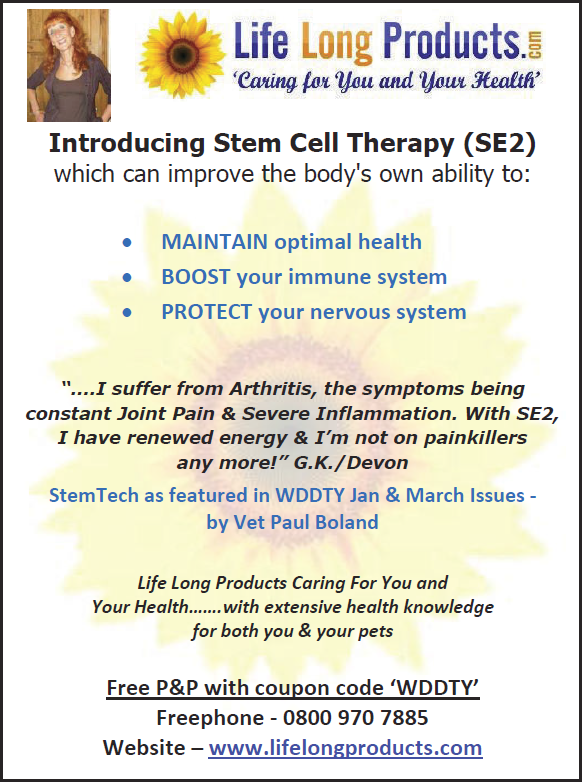 Stemtech’s SE2® is the world’s first all-natural supplement documented to support the release of adult stem cells from bone marrow. Our advanced supplement puts more stem cells in the bloodstream, and the effect lasts longer. This 'advanced supplement' doesn't come cheap, of course: a bottle of 60 capsules costs £60.95 (plus shipping), but it might seem a bargain if the claims stood up to scrutiny. But this product isn't regulated by the Human Fertilisation and Embryology Authority or even the Medicine and Healthcare products Regulatory Agency (MHRA): it isn't stem cell therapy derived from bone marrow, umbilical cord blood, etc, but simply a food supplement. As a food supplement, the only claims permitted in advertising are those listed on the EU Register of nutrition and health claims and in the UK, those advertising claims are regulated by the Advertising Standards Authority (ASA). Because we didn't believe the claims being made were authorised claims, we submitted a complaint to the ASA. While we were at it, we looked further at the advertiser's website and included complaints about some of their other products: Jamu (cached), Forever Freedom® Aloe Vera Juice (cached), Serrapeptase (SerraEnzyme)- High Potency Capsules (cached) and PainSolv MkV Class IIa Medical Device (cached). Jamu (formerly Djamu) is traditional medicine in Indonesia. It is predominantly herbal medicine made from natural materials, such as parts of plants such as roots, bark, flowers, seeds, leaves and fruits. Materials acquired from animals, such as honey, milk, Ayam Kampung eggs and goat’s bile, are also often used. 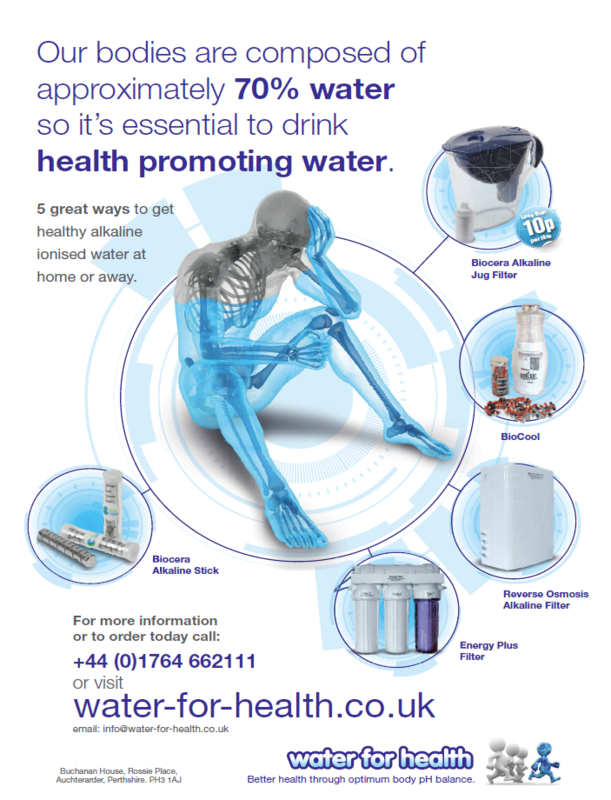 …and they listed more than a dozen products in the range with descriptions such as 'Cholesterol Control', 'Naturally Lowers Blood Pressure', 'Naturally Dissolves Kidney Stones' and 'Naturally Reduces Blood Glucose Levels'. The ASA originally said they would contact Life Long Products and ask for their comments on several points they identified in the website advert for PainSolv references to pain reduction and management; some of the claims were made in a video on their website, but which is also within the ASA's remit. The advertiser could then provide the required evidence to substantiate the claims or agree with the ASA to remove the claims. …remove the health and disease claims from their Stem Cell Therapy, Aloe Vera and Serrapeptase, and to remove the Jamu products from their marketing activity. Although not stated, we believe the Jamu products were unlicensed medicines that would be a breach of the Human Medicines Regulations 2012 to advertise, supply or sell to the public and we're pleased to see that there is now no reference to these products on the advertiser's website. Serrapeptase has, of course, been the subject of a previous complaint of ours against an advertiser in What Doctors Don't Tell You. That time, the ASA adjudicated on the evidence Good Health Naturally provided but ruled it was not adequate to substantiate the claims made. They upheld our complaint on all four points, identifying eight breaches of their CAP Code. …implement suitable changes to their website to bring it in line with the CAP Code. So, instead of an adjudication, the ASA have today published the outcome of our complaint as an informally resolved case. Except… although the advertiser has removed all mention of their Jamu products from their website, we see no other changes as yet. If those pages don't change soon, we'll bring them to the attention of the ASA. The charity HealthWatch (not to be confused with the recent NHS organisation "Healthwatch England") has a study under way to test the effectiveness of consumer protection laws against misleading health claims. A previous study by HealthWatch, Spurious Claims for Health-care Products: An Experimental Approach to Evaluating Current UK Legislation and its Implementation found some worrying results showing widespread variation in the application of consumer protection law and a reluctance to enforce it to protect consumers. Now is the time to build on that research with this bigger study. Useful data are coming in, but more volunteers are urgently needed. Request traders for evidence to support claims made on their websites. You will be provided with trader details, 5 for each volunteer. Ask traders to stop making false claims. Complain to Trading Standards, via the Consumer Direct website. Follow up each complaint for six months. All data are captured in a suite of online forms, and results will be submitted to a major journal. If you are interested, please contact HealthWatch trustee Les Rose. Although it's not at all labour-intensive (so the current team reports), please only volunteer if you have the time. A year ago, we reported on the decline in the number of English NHS prescriptions for homeopathy that were fulfilled in community pharmacies. This showed a steady decline over the previous 17 years, down to just 7.5% of the number in 1996, with each year fewer than the previous. These data come from the Prescription Cost Analysis data for England provided by the Health and Social Care Information Centre (HSCIC), the official source of data on the NHS. My blog post, An idiot’s guide to understanding NHS homeopathy prescription data, gave the details of where these data came from and how to extract them so anyone could check for themselves. The information is published annually and the data for 2014 have just been published. So, has the decline of the previous 17 years been halted? I've updated my charts to include the new data from 2014. In 2014, the number of prescriptions for homeopathy fell for the eighteenth consecutive year, this time by over 21% — the fourth largest percentage fall since 1995 — continuing the downward spiral. The number of prescriptions are now just 6% of what they were at their peak in 1996 — a fall of over 94%. The total cost of these prescriptions also fell by 20% to a new low. The cost per prescription has risen again, this time by 2%, compared to an increase of 13% in 2012/2013. It's clear that doctors are writing fewer homeopathy prescriptions, but because these figures are for England only, the decisions by NHS Tayside and NHS Lothian in the past few years (and the recent decision by NHS Lanarkshire) to cease funding homeopathy referrals cannot explain this continued decline. At the start of World Homeopathy Awareness Week, perhaps doctors are now more aware than ever that prescribing 'medicines' for which there is no good evidence can no longer be justified either on medical1 or ethical2 grounds. 1 “NHMRC Statement on Homeopathy and NHMRC Information Paper - Evidence on the Effectiveness of Homeopathy for Treating Health Conditions | National Health and Medical Research Council.” Accessed March 11, 2015. http://www.nhmrc.gov.au/guidelines-publications/cam02. 2 Shaw, David M. “Homeopathy Is Where the Harm Is: Five Unethical Effects of Funding Unscientific ‘remedies.’” Journal of Medical Ethics 36, no. 3 (March 1, 2010): 130–31. doi:10.1136/jme.2009.034959. Our supporters (and others) will remember our long-running campaign to test the resolve of the Complementary and Natural Healthcare Council to protect the public by properly regulating their members. With your help, we gathered many examples of claims that you did not think were backed by good evidence or otherwise were not complying with the CNHC's Code of Practice or the Advertising Standards Authority's CAP Code. We highlighted some of these: Endemic problems with CNHC registrants. Last December, we reported on the re-accreditation of the CNHC by the Professional Standards Authority, giving them what we strongly believe to be unearned and undeserved legitimacy. We also documented the long story of events about how the CNHC had dealt with these 10 complaints — it was long because we felt it necessary to record just how the CNHC had dealt with them. At the end of that chapter, the 100 initial complaints had been 'informally resolved' by the CNHC and our sample of ten of these that we did not believe had been properly resolved were on hold while we provided a list of the 'specific words' we had concerns about (even though we had already done that). We subsequently provided the CNHC with a list of specific words so that they could have no more excuses for not doing their job and dealing with our complaints. Out of those ten, five were dropped because they were no longer CNHC members, leaving just five. We don't know why these five are no longer registered, but a 50% drop out is interesting. A manifestation of the OfQuack Paradox, perhaps? If you remember, I provided the CNHC with screenshots of the pages I was concerned about with specific text highlighted in yellow, such as the one on the right. Click here to see that extract in the context of the complete page. 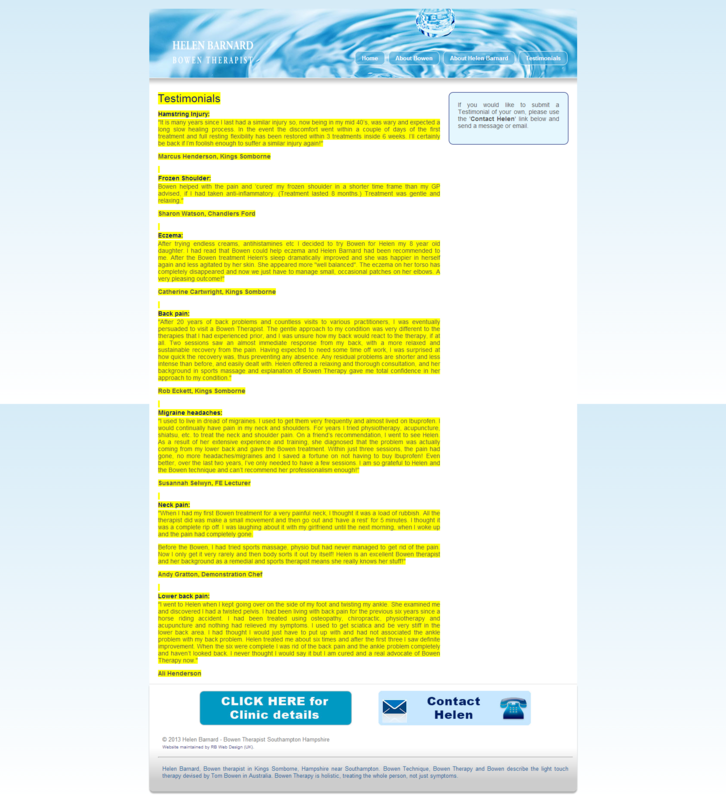 Some pages had more text highlighted than others. In respect of the remaining five complaints, when I try to download via Dropbox the compressed file that contains screenshots of the web pages and copies of documents listed with highlighted text, using the link you sent me, I receive a ‘malicious download warning’. I would be grateful if you could check your zip file and send me a fresh link. Regarding the zip file, I don't understand what the issue is: can you tell me if you have had any trouble downloading the file previously? I got the same warning message when I tried to download it originally but didn’t raise it with you at that time because you were stating then that your complaint was about every word on every page. So, even though I had provided the CNHC with screenshots of the pages I was concerned about with the words I was concerned about highlighted for them to see last June, they hadn't bothered looking at them. The CNHC never confirmed whether they did, finally, look at the screenshots I had provided. …evidence that the wording on her website about which you complained is in line with very detailed advice that she received from the Committee of Advertising Copy Advice Team in December 2013. I can confirm that this complaint has been resolved informally. …published RCT evidence to support claims in respect of all but two of the 10 conditions/symptoms that appear on the acupuncture page on the Longfield Polytechnic website. The two are overactive bladder syndrome and temporomandibular (TMD/TM) pain. References to them have been removed from the website page. I can confirm, therefore, that the complaint has been resolved informally. A third was 'informally resolved' on 12 February; a fourth on 6 March and the final one on 20 March. So, the CNHC were happy that they had informally resolved them and that these were now fully compliant. But did we agree? We'll be saying more about the rest of them later, but, no, we don't think some of these websites are now fully compliant with the CNHC's own 'therapy descriptors', their Code of Conduct, Performance and Ethics or the ASA's CAP Code. Let's look at the fourth one that the CNHC told us was now 'informally resolved'. 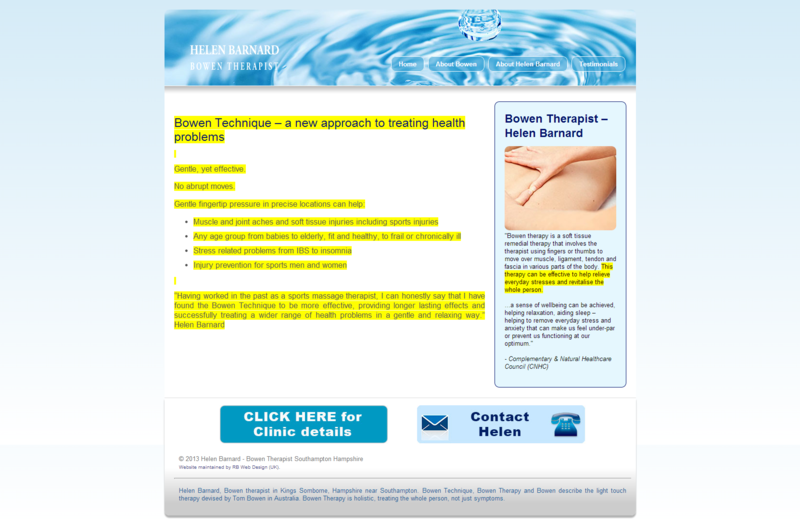 This registrant's website, http://www.helenbarnard.co.uk/, made claims for Bowen therapy. 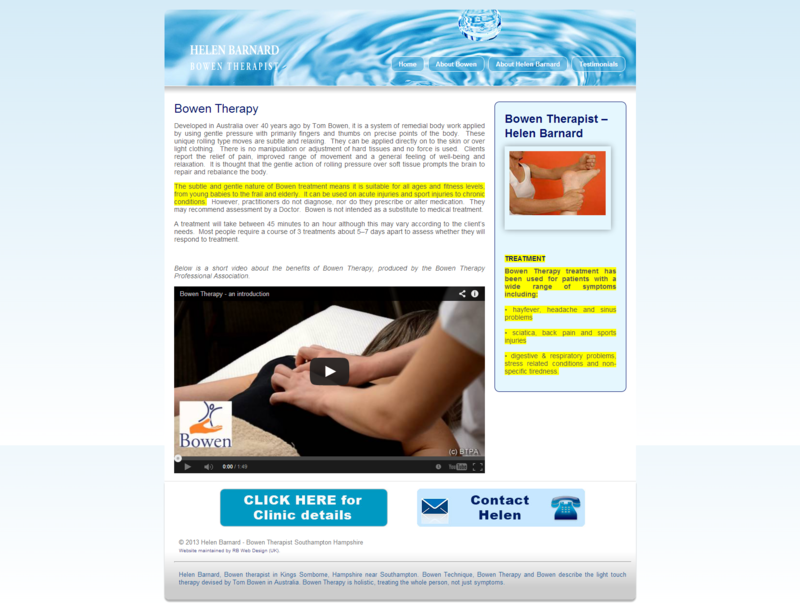 If you've not heard of this particular 'therapy' before, take a few minutes to watch this video from the Bowen Therapy Professional Association, the trade body to which Helen Barnard belongs. the relief of pain, improved range of movement and a general feeling of well-being and relaxation. , it is suitable for all ages and fitness levels, from young babies to the frail and elderly. It can be used on acute injuries and sport injuries to chronic conditions. The last ones were claims made in testimonials. 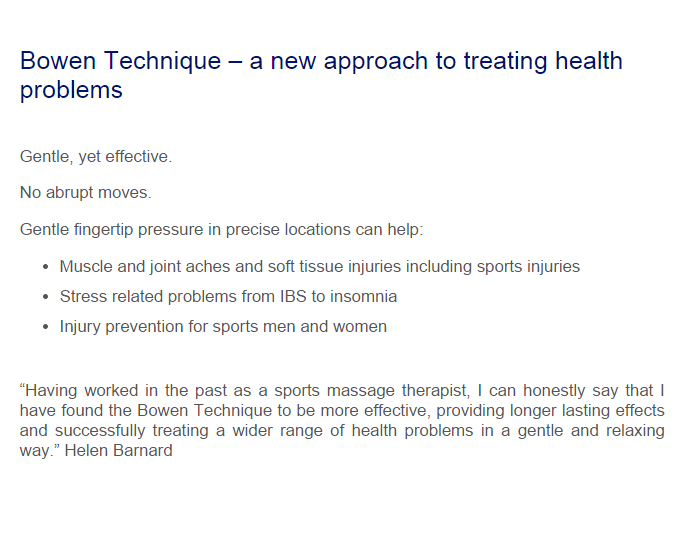 This technique uses pressure to mobilise soft tissue. CAP accepts that marketers can make claims about relieving stress or anxiety and helping relaxation. 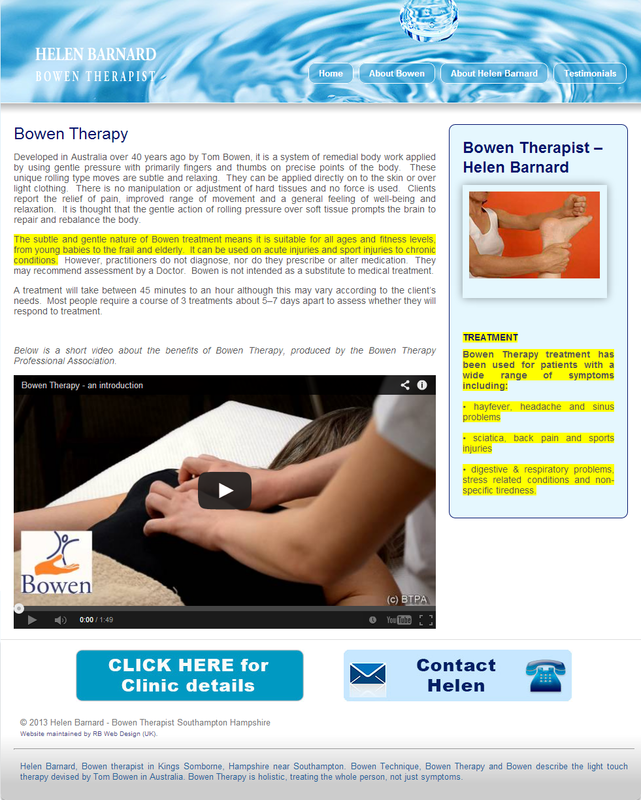 In August 2012, the ASA upheld a complaint about general claims that the Bowen technique could increase flexibility and improve movement (The Bowen Consultancy, 22 August 2012). Although it rejected some claims, the ASA accepted that the Bowen technique could improve flexibility, in the short term, of hamstring muscles in healthy, fit adults aged 18-50 years with no musculo-skeletal symptoms. Claims to improve flexibility would need to be qualified in those terms. Neither CAP nor the ASA has seen evidence that the technique can treat other conditions and advertisers should not refer to conditions for which medical supervision should be sought (Howard Bult, 8 February 2012). It should be clear to many that the claims made by Helen Barnard are problematic at best. 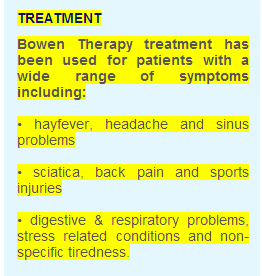 "The subtle and gentle nature of Bowen treatment means it is suitable for all ages and fitness levels, from young babies to the frail and elderly. It can be used on acute injuries and sport injuries to chronic conditions. However, practitioners do not diagnose, nor do they prescribe or alter medication. They may recommend assessment by a Doctor. Bowen is not intended as a substitute for medical treatment." 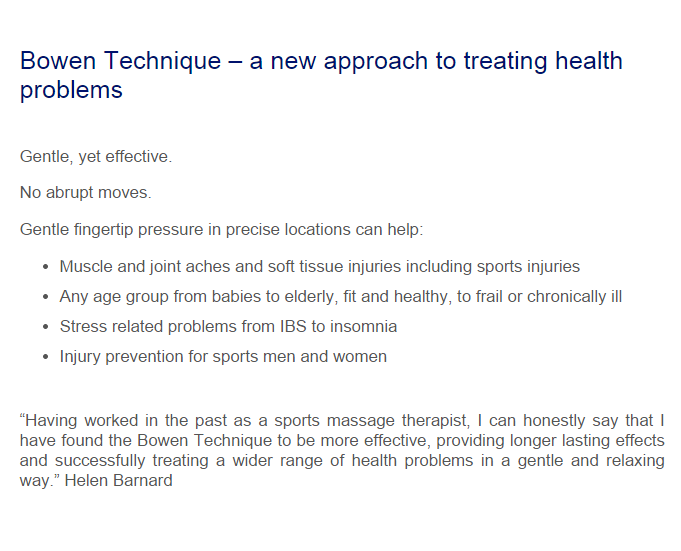 "Gentle fingertip pressure in precise locations can help any age group from babies to elderly, fit and healthy, to frail or chronically ill."
“The subtle and gentle nature of Bowen treatment means I have clients of all ages from young children to the elderly”. She has also removed any reference to specific health conditions for which suitably qualified medical advice should be sought. I confirm that this complaint has been resolved informally. This was the only page to change but it's good to see that the advertiser removed some of these words. But why has it taken the CNHC two attempts to get this website changed? They have twice told us all the websites we complained about had been rectified and that they were now compliant. But, even after all that, are they? Before we look at that, the CNHC's phrase 'health conditions for which suitably qualified medical advice should be sought' is significant. Marketers must not discourage essential treatment for conditions for which medical supervision should be sought. For example, they must not offer specific advice on, diagnosis of or treatment for such conditions unless that advice, diagnosis or treatment is conducted under the supervision of a suitably qualified health professional. Accurate and responsible general information about such conditions may, however, be offered (see rule 12.11). Health professionals will be deemed suitably qualified only if they can provide suitable credentials, for example, evidence of: relevant professional expertise or qualifications; systems for regular review of members' skills and competencies and suitable professional indemnity insurance covering all services provided; accreditation by a professional or regulatory body that has systems for dealing with complaints and taking disciplinary action and has registration based on minimum standards for training and qualifications. There are, of course, no medical conditions listed by the ASA that they would allow an advertiser of Bowen therapy to claim to treat. But that's not the whole story. As well as 'health conditions for which suitably qualified medical advice should be sought', the advertiser listed other medical conditions that were not on the ASA's list — as shown on the screenshots above. Why weren't they removed? Why were the CNHC content with the advertiser removing just the more serious medical conditions? The CNHC seem to think they had done their job and declared the case closed. We were not so easily convinced and we don't think that the CNHC should have been content either; not if they were competently doing their job of protecting the public, that is. But we're not the ones to judge these things: that's what the regulators are there to do. In fact all we are able to do is question claims made, submit complaints to the relevant organisation and let them decide according to their own rules and procedures. We've been extremely patient with the CNHC and already given them two attempts and nearly two years to ensure the websites of the registrants we'd complained about were properly dealt with. We could see no point in trying a third time, so we've submitted complaints to the ASA who we know will deal with the issues professionally, competently and thoroughly, in the interests of protecting the public from misleading claims. So far, we've submitted three complaints to the ASA about the websites that the CNHC have told us they are happy with and a fourth will be submitted soon. The outcome of the first of these complaints — Helen Barnard's website — is published today as an informally resolved case. We'll tell you about the others once they've been resolved by the ASA — and what we propose to do subsequently. Our ASA complaint was essentially about the same words and some claims made in a video on her website. The ASA asked her to remove some claims from her website as they had previously been investigated and found to breach the CAP Code. They were going to ask her to provide evidence for the other claims, but she told the ASA she had taken her website down and that if it was live again, it would include her qualifications only. As far as the ASA is concerned, the case is closed: the misleading claims are no longer being made. As far as we're concerned, this is not the end. What we have shown is that, despite the CNHC's assurances that her website was fully compliant, the ASA decided otherwise. Who should we place our trust in? Who should the public place their trust in? One who sets high standards and adjudicates fairly to protect the public? Or one who claims to but seems to pay lip service to protecting the public from its members? So, is the CNHC fit for purpose? That depends on whether their purpose is to protect the public or protect their members. We'll leave you to decide.